We all know how important is to build a solid list of email subscribers, but it is even more important to make sure that everyone on that list is there because they want to be. No matter what the nature of your business or size of your email list, giving recipients a fast and convenient way to unsubscribe is essential. The process of handling those unsubscribe requests should be fast, easy and painless. Hiding the unsubscribe button, or obscuring it behind other text, is always a bad idea. Anyone who reads your email should be able to quickly locate the unsubscribe button and handle the subscription they way they want. A clean unsubscribe process will not hurt you. In fact, it can improve your email reputation and cause others to see you as a reputable sender. Customers will be more likely to subscribe in the first place if they know they will be able to easily unsubscribe later. The new unsubscribe feature included in SendBlaster 3, called Global Unsubscribe, will make maintaining your email list fast and easy. How Does the Global Unsubscribe Feature Work? With the Global Unsubscribe feature, when a user asks to opt out of your email list, he or she is automatically unsubscribed from all your lists. The Global Unsubscribe tool scans all of your mailing lists for the opt-out mailing address and does all the hard work for you. This means that you will not need to manually update your lists anymore! 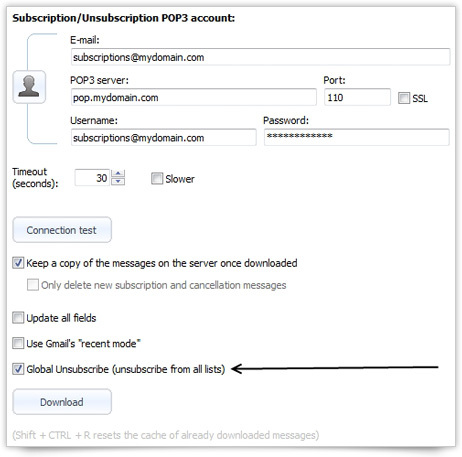 Enabling the Global Unsubscribe option could not be easier. All you need to do is go to the Manage Subscriptions section of SendBlaster 3 and click the Global Unsubscribe check box. Until you activate the Global Unsubscribe feature, those who request an opt-out will be unsubscribed only from that individual list. Their email address will remain a part of all your other lists. This feature can be especially useful for marketers who need to maintain a large number of email lists. Managing multiple mailing lists can be time consuming; you would be better off using that time crafting the perfect message and creating the best possible subject lines. SendBlaster 3 also includes another powerful feature – one designed to handle bounces quickly and efficiently. Bounce rates can severely impact your reputation and even get you branded as a spammer. 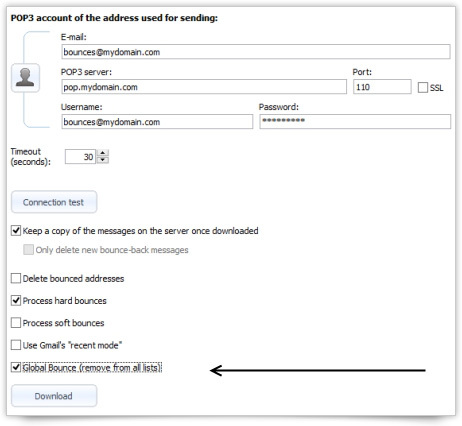 The Global Bounce feature built into SendBlaster 3 is designed to help you avoid those problems and keep your email lists as clean as possible. With the Global Bounce feature in place, you can remove all hard bounces, not just from the selected list but from all the email lists you manage. This feature allows you to remove any invalid email addresses from all your lists at the same time, saving you considerable time and effort. Turning on the Global Bounce feature is exceedingly simple. All you need to do is go to the Manage Bounce-Backs panel and check on the Global Bounce check box. Do not underestimate the importance of managing your email lists and keeping them as clean as possible. A clean email list is an efficient email list, and every invalid address is one more risk to your business. Keeping your email lists as clean as possible is the best way to increase deliverability, reduce bounce rates and keep your existing customers happy. That is why we strongly recommend that all our SendBlaster 3 users leave these important features enabled. Both the Global Unsubscribe and Global Bounce features are designed to make your life easier and help you manage multiple lists without the hassle. The Global Unsubsribe and Global Bounce features are available in both the FREE and PRO versions of SendBlaster 3!